This post is sponsored by Pyrex, who have provided the world with the most fantastic cookware for the last century. Happy 100th birthday, Pyrex! Strawberry Tart, eh? If you have been following along on instagram you will know that my first born works at a strawberry farm, and regularly comes home with trays and trays of gorgeous strawberries; luscious, sweet, perfectly ripe and just picked strawberries. When Pyrex contacted me and suggested I make an apple pie to help them celebrate their 100 year birthday, I thought Hmmm, apples? I have a better idea…. Break this down into a few steps and it is easy as, well, pie. I’ve made this egg free due to my son’s egg allergies, and I’m so happy with the way the sweet shortcrust turned out I can’t wait to cook with it again. Place the flour, sugar, baking powder and salt into a food processor, pulse a few times to mix. Cut the butter into squares about 1cm big, pulse into the flour mixture until it’s a bit lumpier than if your were making scone dough. You should still see tiny bits of butter. Pour the water in a few teaspoons at a time, just until the dough forms together in a ball, not a second more. The easiest way I find with the ice water is to put some water and ice cubes in a small jug and drizzle it in as you need it, that way the water stays very cold and stops the protein strands from developing in the dough, which ensures the delicious ‘short’ part of short crust pastry. Wrap the dough in glad wrap and rest in the fridge for an hour or so, or even overnight. Just let it rest on the bench top a bit before you roll it out. 1 and a half cups of ground almonds. Puree everything in a clean food processor until well mixed, keep in the fridge until ready to use. Strawberries! I used maybe two punnets worth. Roll out the sweet shortcrust in between some glad-wrap, so it’s easy to transfer to your pie dish. I lined the pie dish with some baking paper to make sure it didn’t stick, but it wasn’t neccesary. Gently push the pastry into place in the pie dish, and trim any excess. Use your fingers to flute the edges of the pie, which is made easy when the pie dish itself has fluted edges! Put another piece of baking paper on top of the pie shell, and weigh down with rice or uncooked legumes. Bake 10 minutes in a medium-hot oven. Remove pie from oven (it won’t be cooked) and remove the baking paper and rice/legume situation. Use a spoon to spread the frangipane evenly over the base of the pie, and return to the oven for another 10-15 minutes, until cooked. Wash and cut the green leaves of the strawberries, cutting them flat so they have a stable base to sit on. 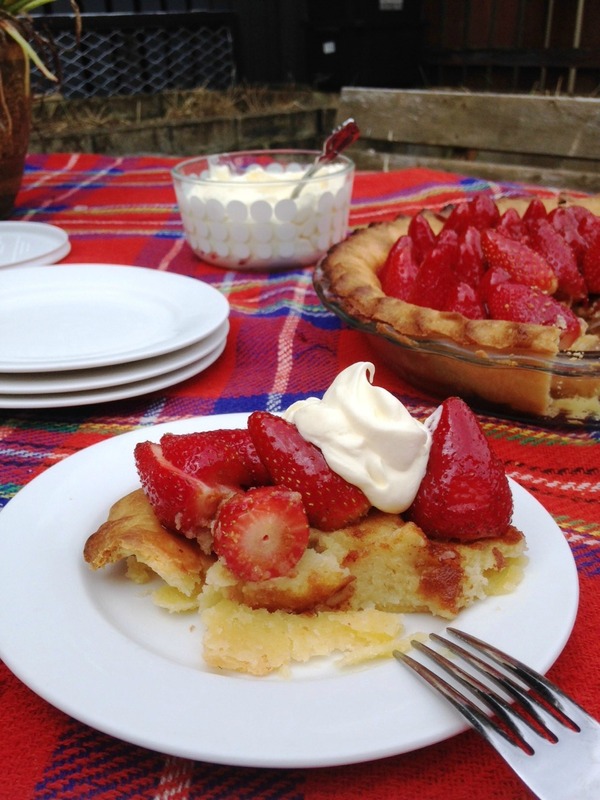 Arrange your strawberries in the pie, pushing down slightly into the frangipane. Heat a few tablespoons of strawberry jam in the microwave, and use a pastry brush to gently glaze the strawberries. Refrigerate until ready to eat. Serve with whipped cream. This was supposed to be taken on a picnic to celebrate the last day of autumn but the weather was a bit threatening, so it was eaten in the backyard for Sunday morning tea with the neighbours. Delicious! To celebrate Pyrex’s 100th anniversary, Pyrex are giving away all the Pyrex equipment you need to bake your own amazing pie! All you need to do is follow the easy Rafflecopter prompts. Make sure you leave a valid email address so I can contact you! Approximately 65 million pieces of Pyrex have been sold in Australia to date, meaning one in five households own at least one piece of Pyrex. Considering it hardly ever breaks, that’s a lot of Pyrex! Approximately 315000 Pyrex jugs (my personal favourite) are sold in Australia each year! Pyrex is super convenient and can be used in the oven, freezer, and microwave and will also survive the dishwasher. The clean design of Pyrex pieces absorb heatwaves in the oven, which speed up cooking time and save energy. Pyrex are available practically everywhere, check out the website for more information and everything else Pyrex. Oh yum! I can't wait to try this when I get back to Australia! Want to know my dirty secret?! I actually kinda love store bought apple pie!! The one and only pie I've ever made was a Banoffee pie I even made the caramel from scratch which surprised a few family members, it was for our 3 kids christenings, they all got christened together at 12,11,8 years old (as I hadn't got around to it- whoops). Anyway the pie was the star of the high tea everyone loved it luckily. I should try making other pies maybe an apple pie needs a try. The best pie I have ever had was an apple pie in the middle of the Namibian desert – seriously. It was so incredible and I will never ever forget it. I'd love to try and replicate it at home. Oh wow! 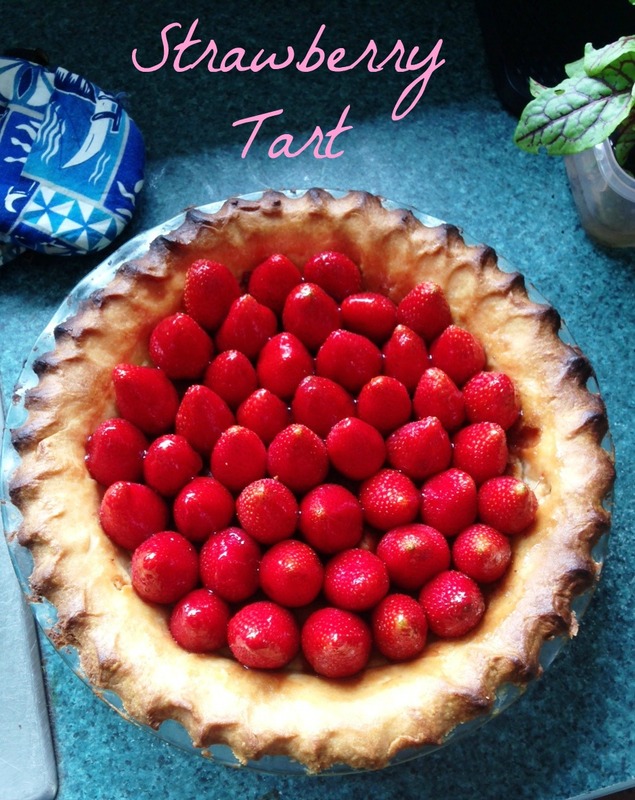 I love strawberries but haven't ever used them in a tart like this one of yours, it looks so good! Thanks for linking up with our Fabulous Foodie Fridays fun. My husband makes the yummiest pie – its the blueberry and ricotta pie – kids love it and he makes it almost every month whenever we request him.